Several proposed projectiles are available, as described in Projectiles. What firing tube was chosen to accomodate them? The 3-inch finishing nail requires a ¼-inch outside diameter firing tube, and all the other projectiles can fit a slightly smaller firing tube. This coilgun will compare firing tube diameters of ¼” and 7/32”. Although these are only 1/32-inch (0.794 mm) different, the cross-sectional area is reduced by 19%. An external iron frame will be built for each of these two firing tubes, and the results compared. The same copper coil will be used in both cases. FEM models of coil diameter suggests a very small difference in kinetic energy, of less than 5%. This comparison will be a useful cross-check on the theory. 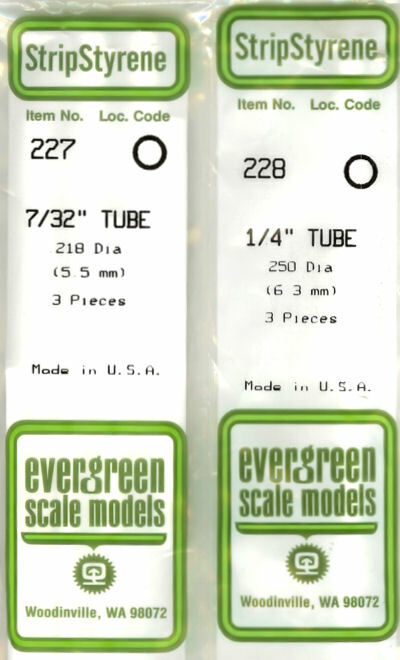 Local hobby shops for R/C car and plane enthusiast often carry styrene tubes in a vast array of sizes in 1/32” increments (0.8mm). 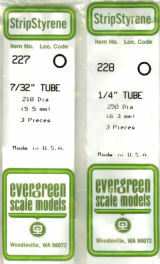 Styrene tubes are inexpensive, convenient, easy to cut and form, have thin walls, are non-magnetic and non-conductive. Disadvantages include their softness, low melting point, and short lengths (12 inches or 300 mm). The packages shown here are typical of what you may find in a hobby shop.